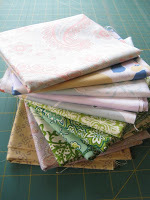 As I mentioned before, I am a fabric junky and I often find myself hoarding fabrics. 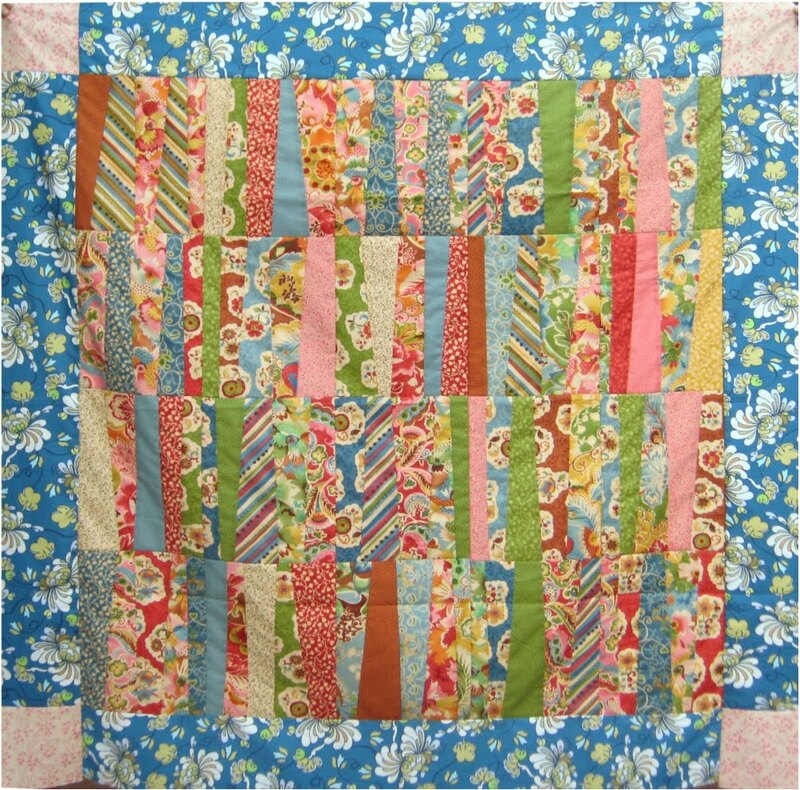 I made this quilt top using a beautiful pack of pre-cut 10″ squares (aka layer cakes) that I had been hoarding and admiring for almost a year. 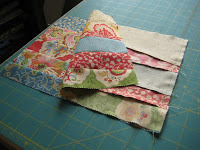 I was finally able to “let go” and use these fabrics for a gorgeous quilt. This is a really simple quilt to make, especially for anyone who is a beginner quilter or wants a quick project. 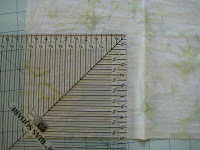 The finished size measures 47″x45.5″. It makes a great lap quilt. 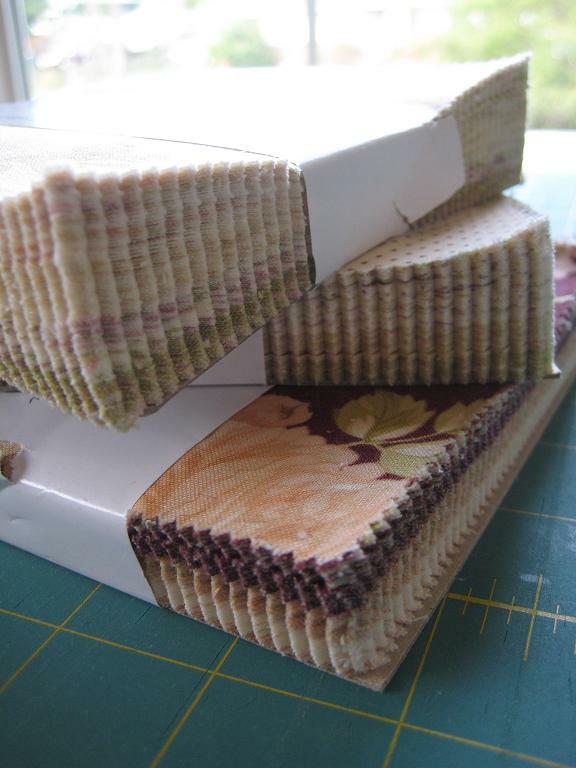 You can buy 10″ pre-cut squares, aka layer cakes. These packs come with forty pre-cut squares, so save the other half for another tutorial I will be posting that will use the remaining 20 squares. 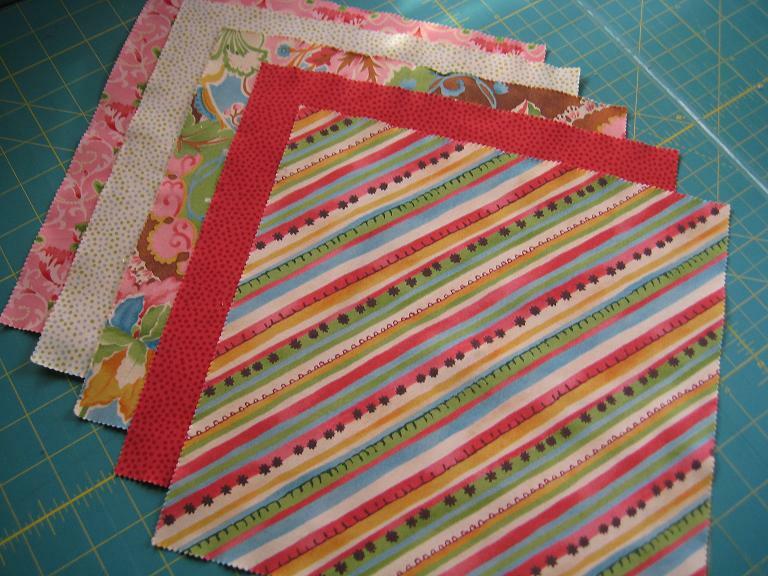 You can buy 10 fat quarters (cut two 10″ squares per fat quarter). 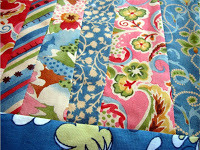 For this quilt I used a layer cake pack which came with about 10 different prints. If you don’t want this many prints (i.e. 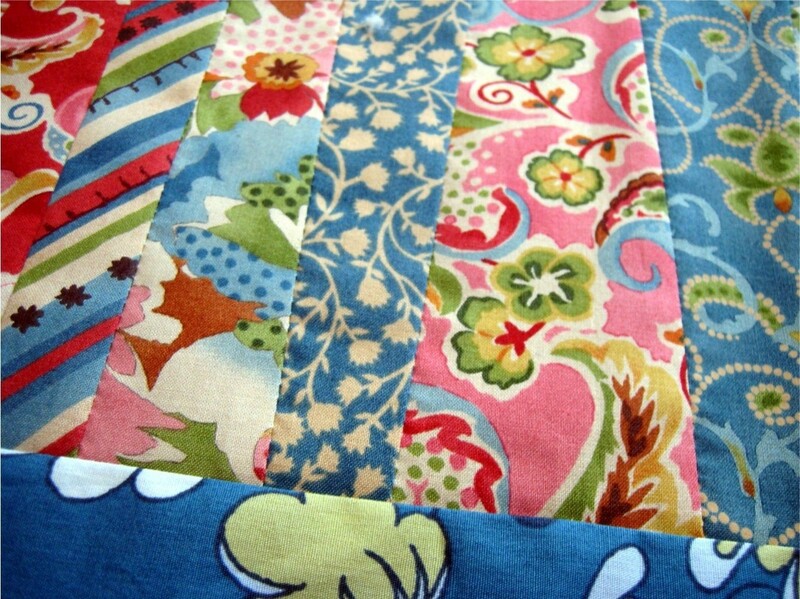 if you just want a blue and white quilt), you can buy fabric by the yard. 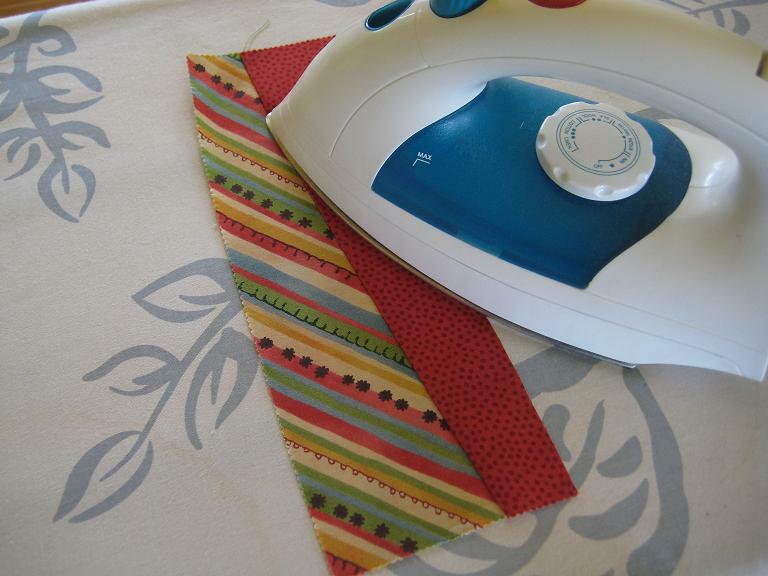 You can cut twelve 10″ squares per one yard of fabric. Divide your stack of twenty 10″ squares into four stacks of five squares each. 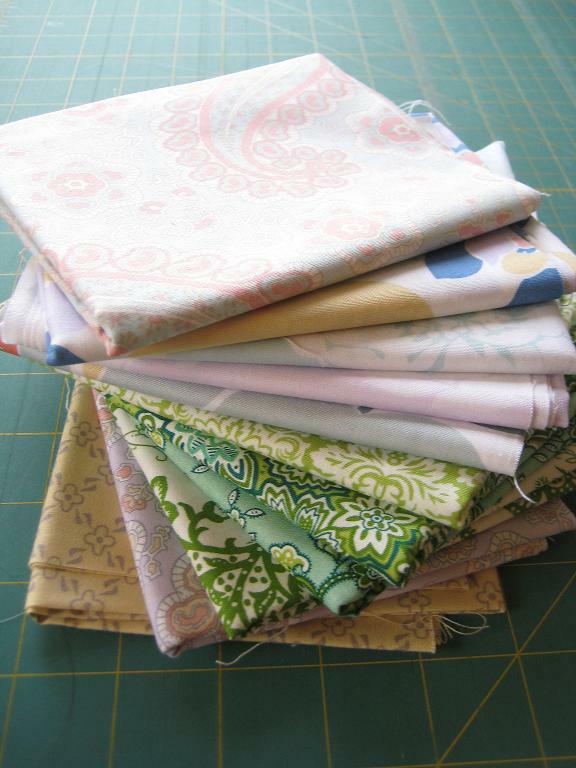 In each stack, layer the squares so they’re perfectly aligned. 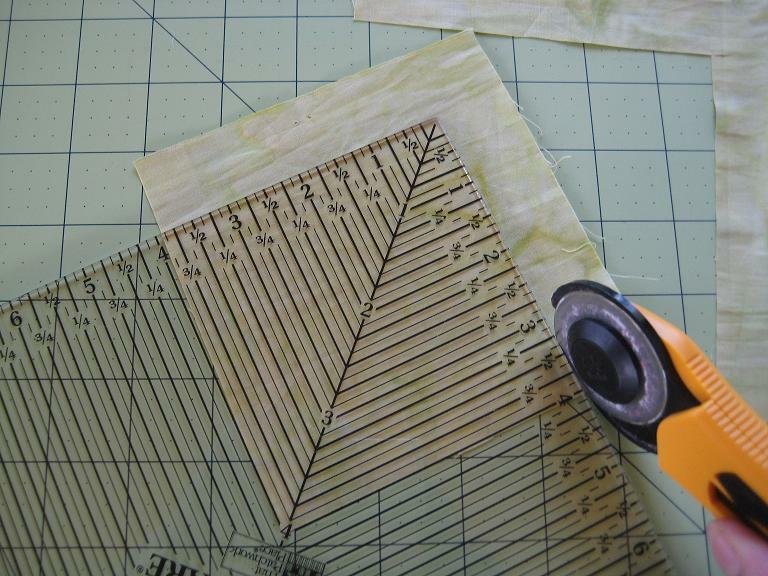 Using a quilting ruler and rotary cutter, make four uneven cuts from each stack (simply tilt the ruler so it’s not square with the edge). 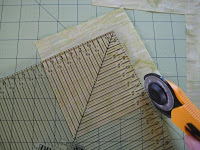 The photos below are an example of cuts made from one stack. 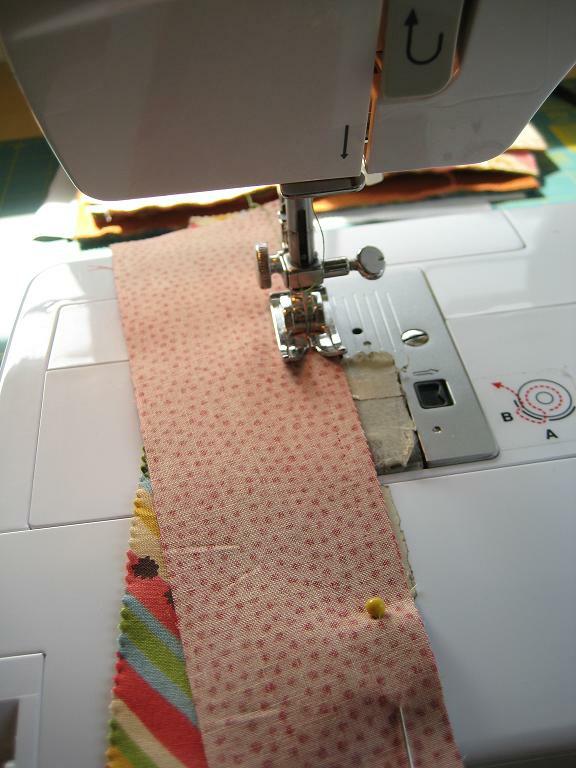 When cutting, be sure that the narrow part of the strip measures ≥ 1.5″ since you will be sewing 1/4 inch seams on both sides of the strip later. 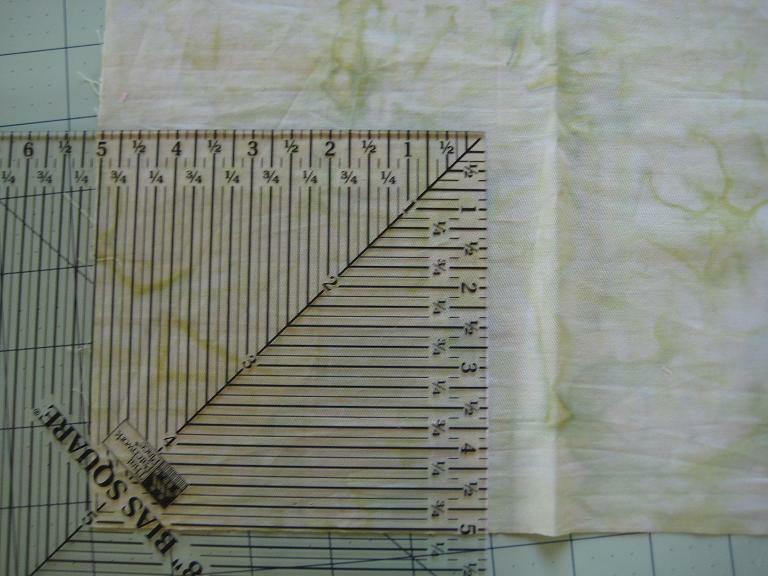 Now that you’ve made your cuts, you will have five stacks of fabric strips; each containing five layers. 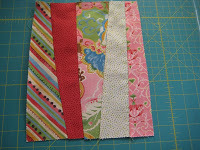 Select one fabric strip from each of the five stacks to form a square as shown in the picture above. 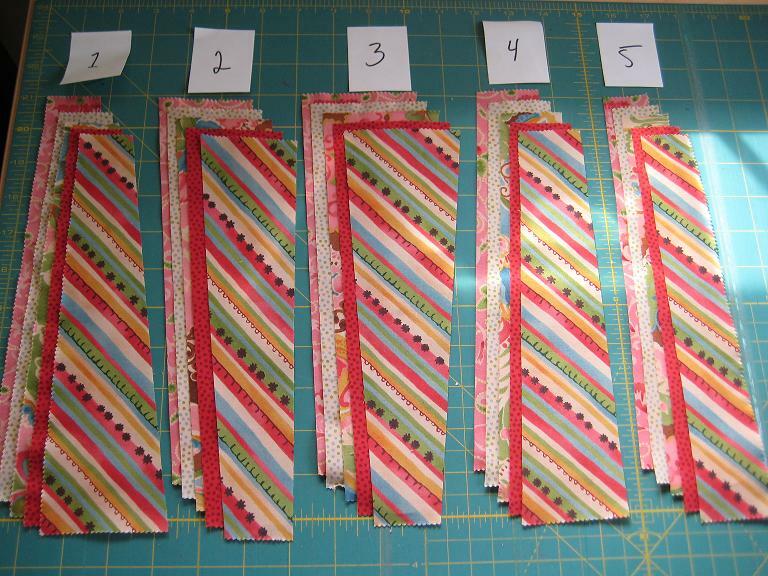 Be sure to arrange the strips in the same consecutive order of the five stacks (i.e. 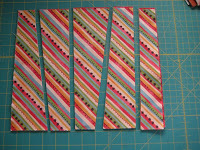 the first strip should should be from stack #1, the second strip should be from stack #2, etc.). 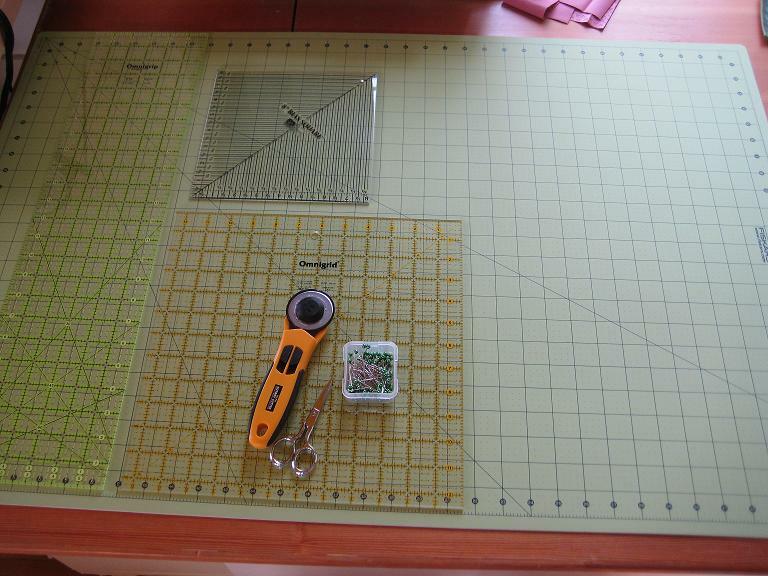 Now that you have the fabric laid out, you can start sewing! 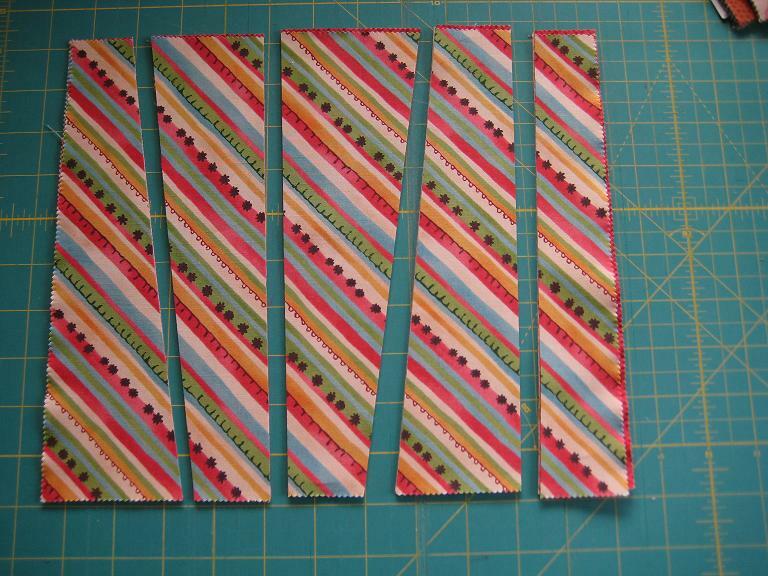 With the right sides of strip #1 and #2 facing each other, align the corners, pin the fabric so it stays in place, and then sew a ¼” seam. 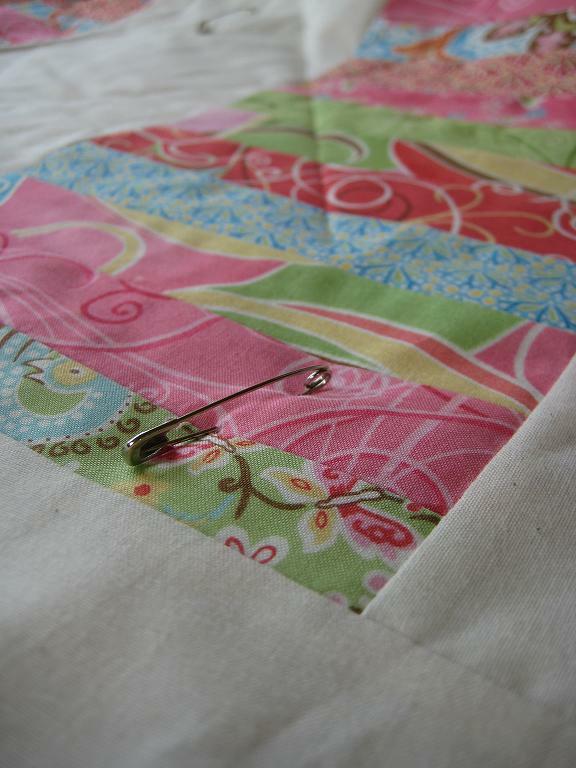 You can do a back stitch (~1/4”) on each end to secure the stitch. 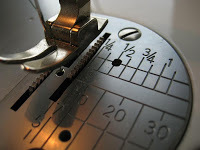 After sewing the ¼” seam, press the fabric open using an iron. 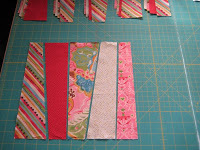 Repeat with strip #3: with right sides of strip #2 and #3 facing each other, align the corner, pin the fabric so it stays in place, and then sew a ¼” seam. Press open. 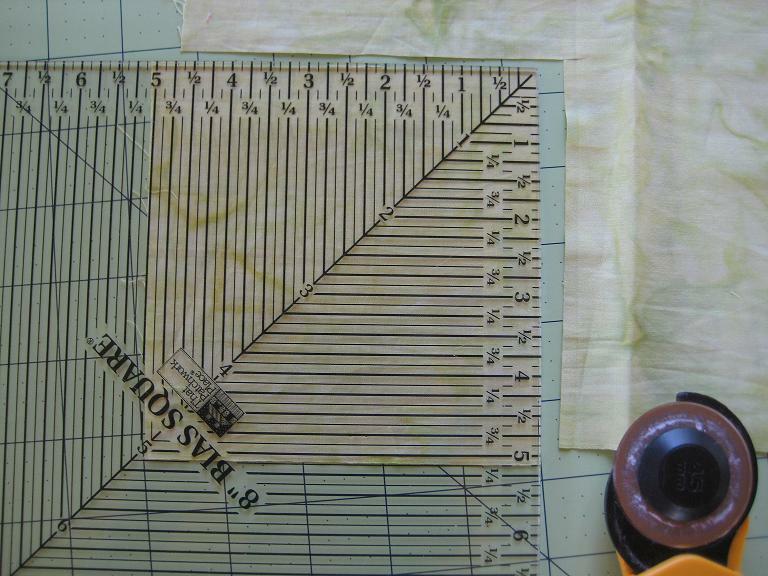 Repeat this process with the remaining strips until you have all 5 strips sewn together to form a 10”x8” block. 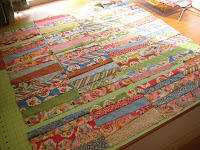 Assemble a total of 20 finished blocks. Once you have all 20 blocks finished, lay them out in five rows of four blocks each as shown above. 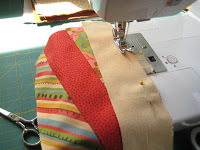 In each row, sew all four blocks together using a ¼” seam, and press open. 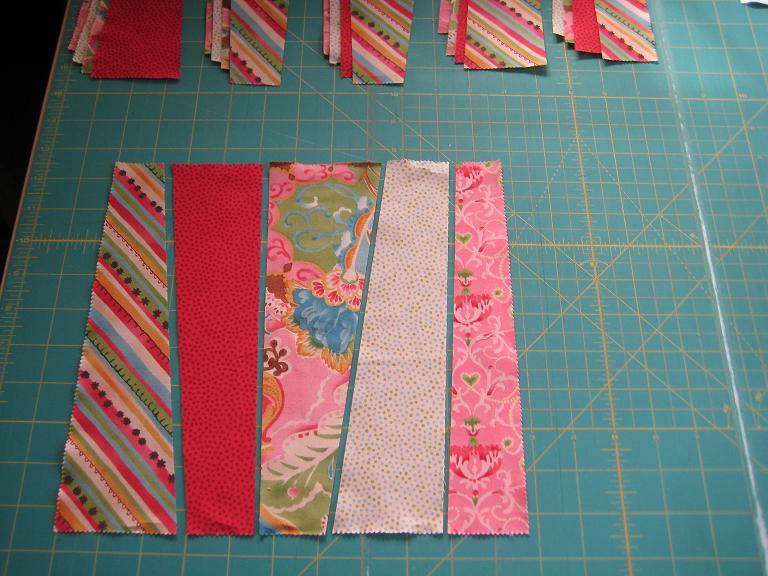 After you’ve sewn the blocks together in each row, sew the rows together. 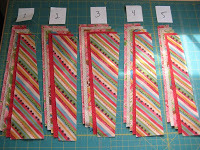 Follow the same process as was used to sew the fabric strips together (with the right sides of row #1 and #2 facing each other, align the corners, pin the fabric so it stays in place, sew a ¼” seam, and then press open). 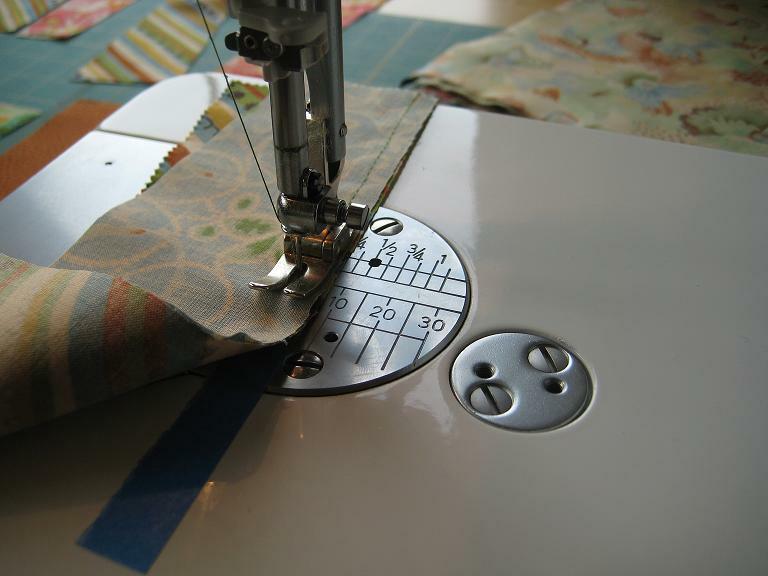 Tip: Slow the machine down while sewing across seams – especially when the seams are going in opposite directions as shown above. When sewing too quickly over a seam, the needle may catch the seam, folding it over and creating a bump. 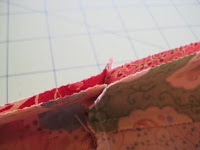 After you’ve sewn all 20 blocks together, all that’s left is sewing on the borders! 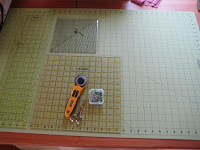 Use the diagram below for cutting the border fabric. [Click the image to make bigger]. Start with sewing the left and right borders (A) using the same method as above: with right sides facing together, align the fabric and pin along the length to keep it in place, and then sew a ¼” seam. Press open. Lastly, sew on the top and bottom borders (C) after you’ve sewn the corner pieces (B) on each end. 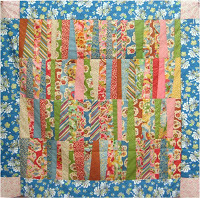 In my next tutorials I will show you how to finish the quilt (i.e. how to baste, quilt and bind your top). Let me know if you have any questions and I’ll try to get back to you promptly. 🙂 If anyone makes this quilt, please send me a picture (if you let me, I’d love to post it)! 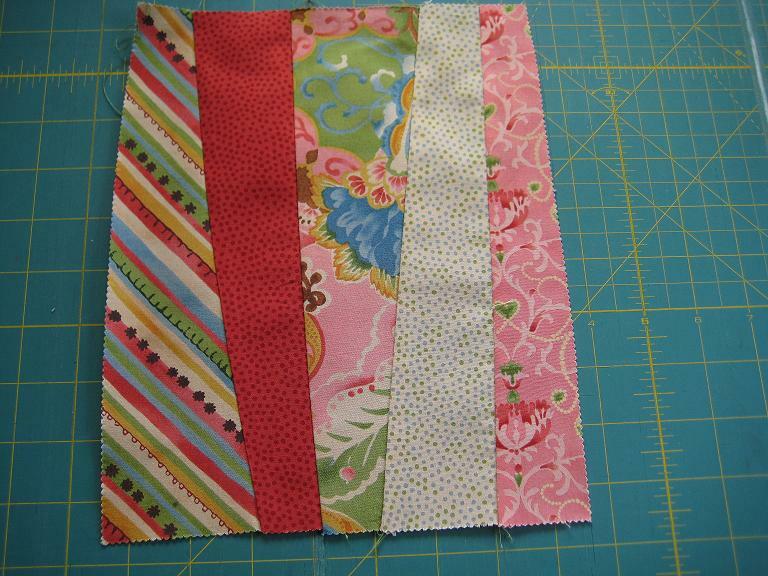 It’s so interesting seeing a single pattern done but with personalized color schemes. Hello to anyone who sees this! 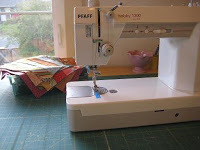 I started this blog because I love to sew and quilt. 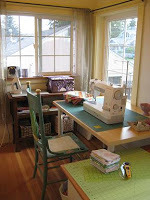 And I’m a total fabric junky and fabric hoard(er) and proud of it! 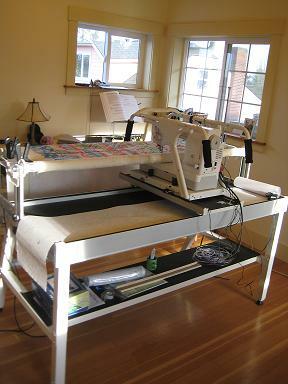 When I set sight on a gorgeous print, it inspires me to be creative (and i drool a little). 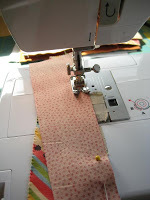 In this blog I plan to post easy-to-follow tutorials on different sewing projects and quilting projects. 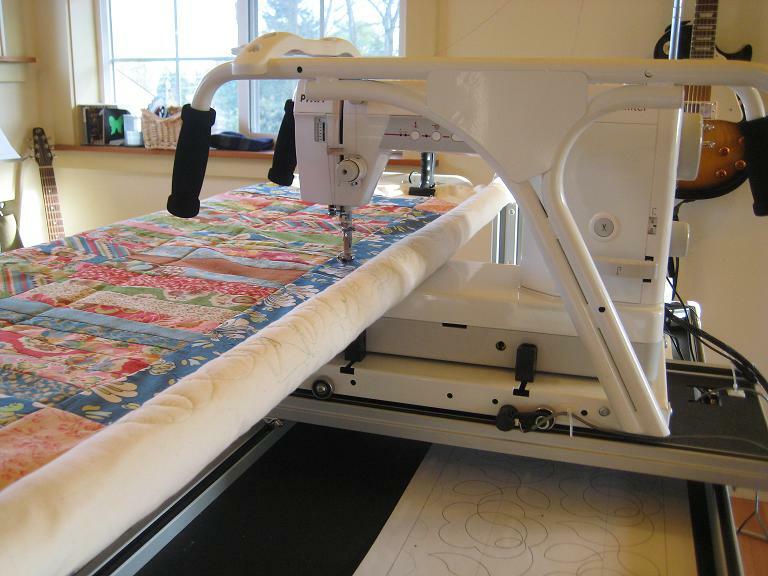 And no worries if you’ve never quilted or sewn before, hopefully my tutorials will get you interested, maybe even inspired to start. 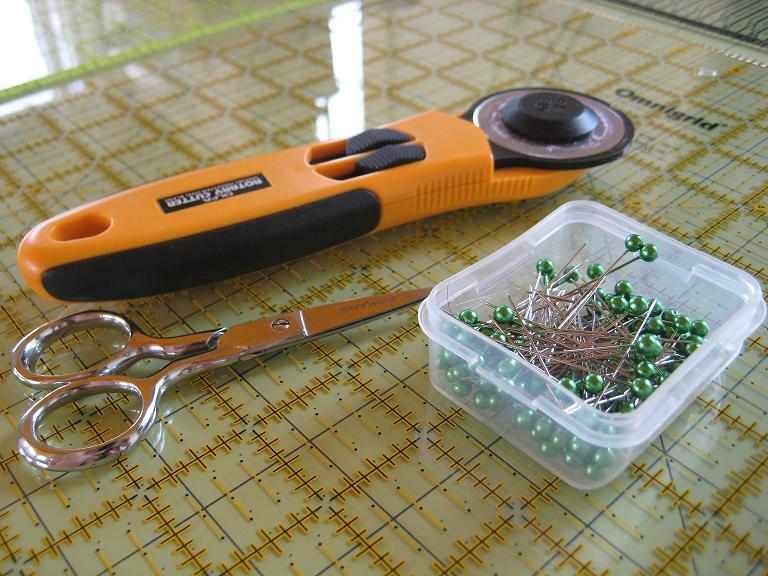 They’ll be simple to follow, anyone-with-opposable thumbs-can-do-it crafts. 🙂 And since I love fabric so much, i hope to eventually offer beautiful, affordable fabrics to you (but that’s still in the works ;). Why Quilting in the Rain? Because i’m located in the rainy city of Seattle. My crafts corner is situated in front of a window and I often find myself quilting in the rain. 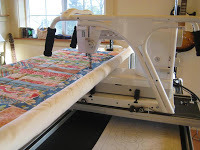 Though, I recently dropped two grand on my new Pfaff sewing machine and quilting frame – if i keep that up I’ll literally be quilting in the rain. She’s a Pfaff Grand Quilter…i haven’t named her yet. My hubby helped me put the frame together. Scratch that. My hubby put the frame together while I fumbled with the manual. Well, that was my little intro. 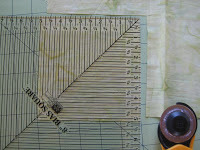 I’ve been working on 2 new quilts and plan on posting tutorials soon. 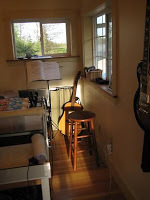 My hubby and I also finished revamping an old, puke-yellow armoire. We painted it and upholstered the doors and basically made it into an ultimate storage unit for all my quilting tools and fabrics. I’ll post before and after photos. 🙂 Until next time..!